JPEG is one of the most popular formats for storing and transferring images, and it normally provides a decent image quality in a relatively small file-size. However, JPEG is also a lossy format, which means it doesn't always provide an accurate image rendering and can include noise and image artifacts. This translates into grainy sections of the image, lack of clarity, reduced color spectrum and other types of image distortions. 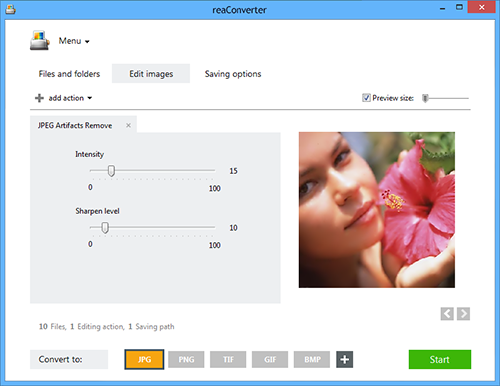 With reaConverter's latest edition you can easily adjust the noise and image artifacts which appear when saving in a lossy format such as JPEG. And this can be done without operating in several image layers, like in the case of other advanced graphics editing programs such as Adobe Photoshop. All you need to do is customize the intensity of the artifacts removal and the sharpening level. Open one or more images you intend to correct. You can add them manually to reaConverter or use the drag-and-drop tool. In this window you will be able to control the intensity of the removal process, as well as customize the sharpening level. Use the two handy scroll bars and check the result of your options in real time, in the right side of the window, after ticking the Preview button. In the Saving options tab you can pick a location for the processed images, as well as a new format. reaConverter allows you to save them both locally — in the source folder or in a customized location. 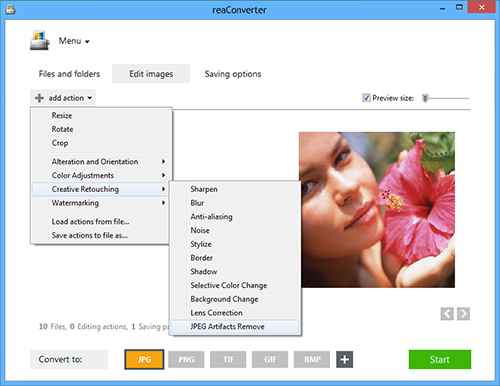 Furthermore, you can convert your images to a new format by simply clicking one of the buttons from the lower part of the window. Then simply press Start and the new images will soon be ready. Command-line JPEG artifacts correction tool is an advanced feature meant for professional use, and is available in Pro edition only.